From 24 Months / 24,000 Miles up to Lifetime! OUR WARRANTY STANDS ABOVE INDUSTRY STANDARD. At Dave’s Ultimate Automotive, we are committed to providing you with the highest quality professional repairs and service at a fair price. We recognize your need for exceptional customer service, and we back up our commitment with the following warranties. While other shops may cover their repairs for 12 months or 12,000 miles, we offer 24 months/24,000 miles as a standard and can offer a warranty for some repairs for as long as you own your car! We are so confident in the quality of the parts and practices we use as well as the skills of our career technicians that, for certian types of repairs and parts, we will warranty them for as long you own your vehicle. That means that if something is covered by our lifetime warranty and you ever have a failure to a component that we replaced on your vehicle, just bring us your vehicle, hand us the keys, and leave it to us to get you back on the road at no cost to you! In some cases, Dave’s will not be able to offer a lifetime warranty for a particular repair. In these instances, your repair will still be covered by our industry leading 24-month, 24,000 mile nationwide NAPA AutoCare warranty. *Lifetime warranty is restricted to Diamond VIP’s only. Lifetime warranty is restricted to certain types of repairs. Repairs must be performed with parts determined to be of appropriate quality and must accompany best practices for that repair. “Wear and tear” and maintenance items** are covered by either our lifetime warranty or by standard wear warranties that apply to that item. 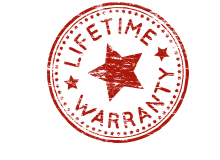 Lifetime warranty is not transferable and can only be honored at the Dave’s location in which it the original service was performed. Dave’s will not pay another facility to perform warranty repairs. To keep warranties in effect, some maintenance terms may apply. Dave’s reserves the right to void any warranty if there is evidence of abuse, modification, neglect, intentional damage or repair of another system has affected the original warranted repair. Dave’s will not warranty any parts of the vehicle that was not repaired at Dave’s, regardless how damaged. Other exceptions may apply. Dave’s reserves the right to terminate this lifetime warranty offering for any location at any time without notice. **“Wear and tear” and maintenance items include, but are not limited to: brakes, tires, belts, wiper blades, fluid flushes, most gaskets, etc.